Below you will find important information on some of our products and here we also listed some of the most common questions we’ve received over the past. If your question is not answered here, please feel free to contact us at any time and we will assist you as best we can. 01. 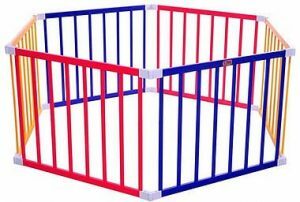 Why should I buy a playpen? These high-sided, enclosed play areas are popular because they allow parents to put their baby down with the knowledge that their little one can’t wander off. However, playpens are no substitute for adult supervision — never leave a child unattended in a playpen. Both my children have spent more than a few hours in our playpen in the first year of their lives. At the beginning it was just a nice place where they could lie and look at the mobile or play with the baby-gym. When they could sit it was a place where pillows and special toys were kept — a place to put them when I needed both my hands. When they started to crawl it became a safe place where they could also experiment with some new moves. Even when they were older than 12 months I put them in the playpen always surrounded by toys or books. Why include a playpen in your home? Well, it serves an important function. It confines your active baby in a safe and cosy cocoon, with limited area, while you are busy with a chore. But it isn’t often easy to pick the right playpen for your little one. Before you make a purchase decision, you need to answer the relevant questions. Where do you put it? This is one factor you need to consider carefully. It may not be of any use in the nursery, as the crib is already there for your little one. It is best to keep it somewhere else such as the living or dining room. While a playpen can help keep your baby within a restricted space, it doesn’t mean you can leave them without any supervision. Its purpose is to keep your baby confined when you handle chores like cutting vegetables or cleaning carpets. It is, therefore, a good idea to keep it somewhere you can keep an eye on. After you have decided the spot, measure it to know which playpen will fit. Getting something too big or too small for the space will defeat the purpose. It’s best to refrain from choosing a used product, as it may not adhere to the current safety standards. 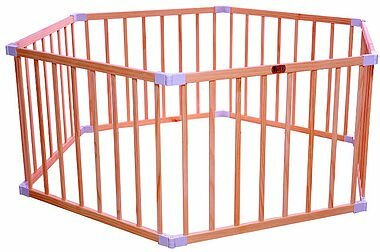 Opt for a baby enclosure from a good brand e.g, Shop Playpens or TikkTokk Playpens. It will provide the best benefit – peace of mind about your baby’s safety. What do you need to make it comfy? Next to the safety factor is the question about your baby’s comfort. If the inside of the playpen isn’t snug, it won’t be well-liked by your son or daughter, especially if he/she has to be in there for considerable time. Make sure the padding on the floor of the playpen is soft and smooth. If you are considering a hand-me-down, check whether the padding underfoot shows any signs of wear and tear. Again, a used playpen may not be your best choice. Also, refrain from adding blankets or cushions in the play space. This may pose as choking hazards. If you have to buy the padding later because the original is damaged, make sure it fits properly to provide the same comfy feel. How much do you spend on it? The expense is another consideration. Many parents have one concern – is it any use investing in something that their baby will soon outgrow? This is also why many parents opt for a used playpen. As a parent, you are sure to consider your child’s safety and comfort to be of primary concern. In such a circumstance, you cannot opt for anything but the best for him/her. And don’t fret; shop smart and you will be able to save quite a lot on this. The easiest way to cut costs is to look for discounts available on purchase. And the holidays are the best time to go bargain hunting. In fact, you need not look far. We, at SP, are offering great deals on the high-quality and durable SP playpens and the TikkTokk playpens. What about the aesthetics? Last, but never the least, comes the question of the look of the playpen. If you are planning to tuck it away from view, you need not bother about this much. But in today’s open plan homes, it may pose as a design dilemma. Don’t worry; today’s makers understand your troubles. 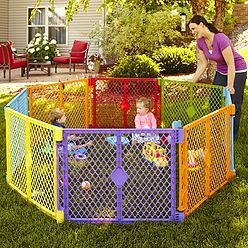 Take for example, the TikkTokk Playpen – Colourful. It can fit into an eclectic, contemporary or casual decor scheme with ease. And it can keep your child within view even in the living room. Want something a little more elegant? Opt for the minimalistic TikkTokk Playpen – Natural. It will blend in effortlessly into your chic space and remain inconspicuous too. Surely, the choices will solve your dilemma at once. Use common sense when you pick a playpen for kids to ensure it’s a correct choice. SAND IN MOTION! 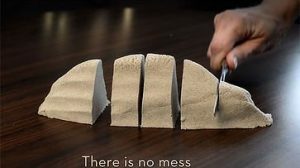 Kinetic Sand is an amazing product that breathes motion. Easy-to-shape sand that moulds into simple desktop designs. 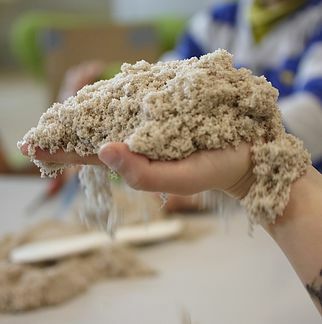 Playing with Kinetic Sand is a magical and mesmerizing experience, giving a moment of relaxation for both young and old.